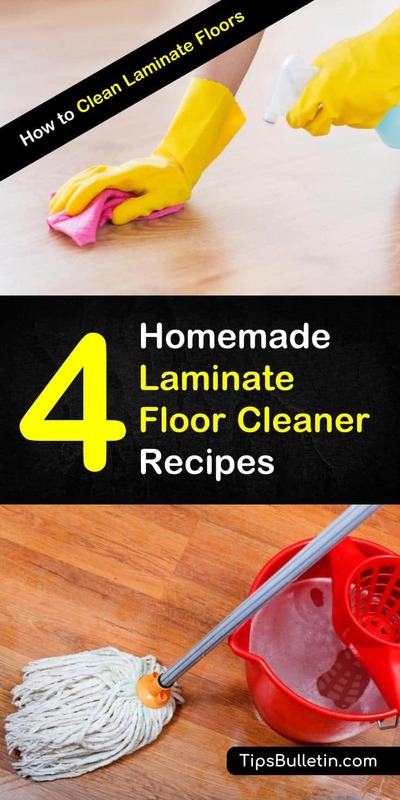 When we first started looking into the topic of how to best clean your laminate floors, we had no idea how many of you would like us to provide homemade laminate floor cleaner recipes. All natural – made from ingredients you have at home. All non-toxic strike free laminate cleaning solutions. Commercial laminate floor cleaners are problematic for me. Some seem to leave a sticky residue that attracts dirt and dog hair, some have strong chemicals that I don’t want in my home, and others have strong odors that get my allergies going. I want a clean laminate floor, but at what price? So we have been testing out natural floor cleaners, trying to find the best DIY laminate floor cleaner – no streaks allowed. We were looking for a cleaner that would be safe and effective for both tile floors and our laminate wood floors. 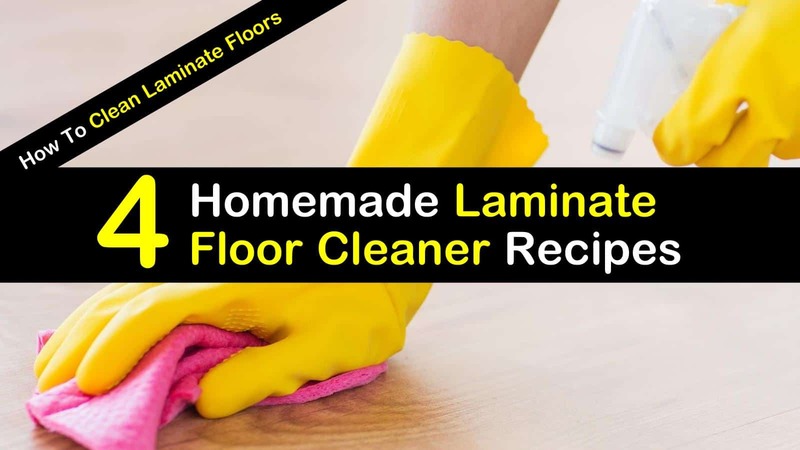 Let me share the best homemade laminate floor cleaner recipes along with information on how to best clean laminate floors and make them shine again. If you are as passionate about using natural ingredients as I am, give these recipes a try. They gave me really good results, and I don’t have to worry about strong chemicals in my home. Perhaps even more important than your cleaner is the technique that you use to clean the floor. The old-fashioned method of wet mopping is not good for your wood floors, especially laminates. The excess liquid can soak into the wood, destroy the finish, and cause warping. A better alternative is to use a barely damp mop or spray the cleaner onto the floor lightly and mop it up, working one section at a time. I prefer to spray the solution onto the floor and wipe it up with a microfiber mop, but if you have a spray mop, it will work fine. If you have tough, dried on dirt, spray the dirt lightly and allow it to soak for a few minutes before mopping, then reapply if necessary. When you finish cleaning each section of your laminate floor, make sure there is no water left behind. A slightly damp floor will dry quickly enough, but there should be no large drops or standing water. This DIY laminate floor cleaner is perfect for cleaning wood floors and laminates. It is also safe for tile floors. While this cleaner recipe includes soap, it does not need rinsing. You are using very little soap, so wiping it up with the mop is sufficient. The essential oils are disinfecting and add a nice clean scent. If you don’t have the essential oils, you can omit them, or you can use any essential oil you prefer. Mix the ingredients in a large spray bottle. A glass bottle is ideal when using essential oils since the oils will eventually degrade plastic bottles, but plastic will work for a while. This floor cleaner recipe uses white vinegar to clean – a highly controversial ingredient. While it is true that vinegar is highly acidic and not good for your wood floors when used full strength, this cleaner is dilute enough to clean your laminate or tile floor without damaging the finish. We covered this vinegar floor cleaner before, but this time with a slightly different mixture. Since it contains no soap, it will not suds, and it will not leave the floor slippery. Vinegar is an eco-friendly cleaner for just about every surface. It is used in most DIY window cleaner and glass cleaner recipes. It disinfects while it cleans. The only negative is the strong smell, but it dissipates quickly once the surface is dry. This is another good laminate floor cleaner suitable for any laminate surface. It is especially good for sticky spots and dried on dirt. The rubbing alcohol which is one of the best natural cleaners, helps it dry quickly, so there are no puddles to harm your laminate floors. It uses a small amount of liquid dishwashing detergent to get up tough dirt and oil spills. No rinsing is needed. Mix this recipe in a large spray bottle and use it with a microfiber mop or with a spray mop. You can use this cleaner for other surfaces as well. It is good for countertops, mirrors, and windows. It will leave your surfaces shiny clean. Over time your laminate wood floor begins to lose its original shine, and you need to get it back. You never want to use wax on your laminate floors; you’ll eventually end up with a waxy buildup that dulls the floor. However, for a deep shine on your wood laminate floors, you need to polish them. Mix the polish in a squirt bottle and keep shaking it as you go. Apply it sparingly and mop it into a very thin film with a clean, dry mop. Make sure you cover the entire floor but don’t let it pool. These homemade laminate floor cleaner and polish recipes are all you need to keep your tile and wood laminate floors looking good. They clean as well as any commercial product, disinfect the surface and save you money. As a bonus, you know that they contain no harmful chemicals and are safe for kids and pets. The essential oils in the recipes are entirely optional, but we find that they give our home an amazing smell. By using lemon or orange oils, we are getting a little extra cleaning and disinfecting power, but you can use any oil you like or leave them out. Do you have a laminate floor cleaner recipe that works for you? If so, I encourage you to share it in the comments, along with any tips you may have for keeping our homes clean. By sharing our best floor cleaning recipes, we help others find eco-friendly cleaning solutions that are safe for our families. Please share this article on social media. Let’s work together to protect our homes and the environment.